Hoofcare & Lameness received word today that Michael J. Nolan, acting executive director of the American Farrier's Association in Lexington, KY, has resigned. "I have submitted my resignation effective January 15," was Nolan's only comment when contacted today. He later added by email, "There is a critical need for an AFA, since no other organizations can offer what AFA can. However, there is so much animosity, so little trust, and so many structural problems that it is going to be very difficult to get back on the right track. "Still, the AFA has been through very bad situations in the past and survived, and I hope it can do so again. The AFA is very important for the welfare of all farriers, and I regret that there was so little progress during my brief time in the office." No news yet on how his departure will affect the AFA or who will assume administrative leadership. AFA President Dave Ferguson has been contacted for a statement, but we have no comment from him as yet. Nolan took the reins of the AFA office last spring on a temporary assignment, and then extended the agreement until the AFA Convention in February, when the organization hoped to have a permanent executive director in place. Presumably more details will be announced by the AFA next week, when the office re-opens. Let's hope 2007 is a better year for the AFA. Hoofcare & Lameness wishes Mike Nolan the best for his future endeavors. Matthew Goins, freelance photographer for the Lexington Herald-Leader in Kentucky, snapped this Harry Potter moment at Keeneland last spring; the NTRA just announced that it was the Eclipse award-winning photo for the year. The photo is the December 2007 image on the big 2007 Thoroughbred racing wall calendar from ST Publishing (which I was delighted to receive in the mail the other day). If you don't already have a wall calendar for 2007, and you like racing photographer or racehorses, this calendar is stunning. It's just a shame that so few of the horses in it will be back to race in 2007. Meet the American Hoof Association. The newly-formed organization of professional hoofcare providers states that its primary goal is the maintenance of sound, useable barefoot horses. Membership will only be offered to applicants who submit proof of work that demonstrates the quality and parameters of sound trimming principles outlined by the founding members. According to information released by the group on December 27, trimmers who seek membership in the organization will believe firmly in the concept that horses must not be harmed in the trimming process and will strive to improve the health of the horses in their care and to improve their skill for the benefit of all trimmers and their horses. They will also need to submit proof of their professional skill via case studies in photographs and on videotape. The organization’s catalyst was author and trimmer Pete Ramey of Georgia; he invited trimming professionals with whom he was well-acquainted to join him in a new qualifications-based organization. In October, 15 founding members became the incorporators of the American Hoof Association, Inc. (AHA). Cliff Mortimer of Highland, Michigan was elected president. Credentials of some of the founding members includes certification by the American Association of Natural Hoof Care Practitioners (AANHCP) and membership in the American Farrier’s Association (AFA). In addition to Pete and Cliff, other incorporators include: Vice President Linda Cowles (California), Secretary Kay Stowers (Oregon), Treasurer Gil Goodin (Texas), Communications Facilitator Kim Cassidy (New York), Member at Large Paige Poss (Virginia) and Member at Large Alex Sperandeo (Georgia). Beginning in 2007, the group will consider applications from trimmers who wish to join. The official list of materials required to be submitted with an application has been posted on the AHA web site, which will include an interactive portal for the upload of all materials except a video that is required and must be sent via mail. From among the incorporators, a team of seven evaluators was selected. Their job will be to carefully and thoughtfully consider all applicant materials against the standards of the American Hoof Association. I'll never forget my one and only trip to New Zealand, more than ten years ago. Everyone I met, it seemed. had a global network of friends made during carefree world adventures. It's as if a new generation of the Kiwis swarms out each year to explore the world and make friends. So when you are a visitor in their country, they are extremely welcome and sympathetic to travelers. An article forwarded to me from the Taranaki Daily News in New Zealand tells the tale of a very focused farrier from New Zealand who set forth to learn his trade from the best in the world, and seems to be succeeding. Mr Ross Finnie, Scottish Minister for Environment and Rural Development has announced that from 30 March 2007 all those practising farriery in Scotland will need to be registered with the Farriers Registration Council (FRC) of Great Britain. The new requirement ends a previous exemption which allowed unregistered persons to practise farriery in the Highlands and Islands areas of Scotland which comprises of: Highland Region, Western Isles Islands Area, Orkney Islands Area, Shetland Islands Area and all other Scottish Islands (including those in the Firth of Clyde). Persons failing to register, and who continue to practise farriery anywhere in Scotland, could be fined up to £1,000. The FRC was established under the Farriers (Registration) Act 1975 as the statutory body responsible for the administration of the “Register of Farriers”. The register records the details of all those farriers who have satisfied the prescribed registration conditions. The Farriers (Registration) Act 1975 was introduced to prevent and avoid suffering by, and cruelty to horses, arising from shoeing by unskilled persons; to promote the shoeing of horses and the training of farriers; to establish the Farriers Registration Council (FRC) to register persons engaged in farriery and to prohibit the shoeing of horses by unqualified persons. The Act came fully into effect in England and Wales in 1980. The requirement to be registered came into force in Scotland on 1 November 1981, but specifically excluded rural areas and islands because of fears that there might not be enough farriers eligible for registration to cover these remote areas and carry out all necessary farriery work. The Acts do not apply in Northern Ireland. Kentucky Derby winner Barbaro met Dr. Scott Morrison from Rood and Riddle Equine Hospital on Tuesday, December 20. Not much has been publicly said about what Morrison may have recommended, although the owners are now hinting to the press that the horse may be moved to Kentucky as early as next week. Barbaro may be on the Good Morning , America television show on Thursday December 21, at approximately 7:30 a.m. Presumably you'd be able to watch the segment on the GMA / ABC News web site . 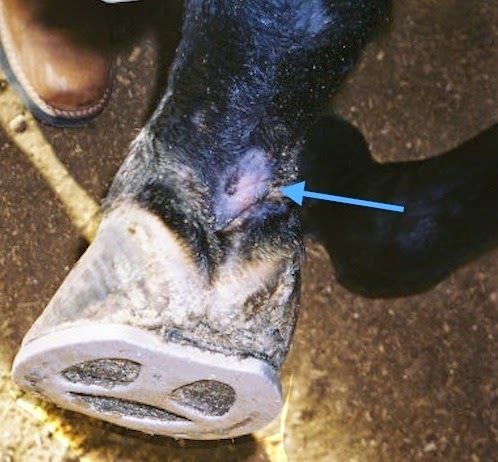 New Bolton Center released a new set of photos of Barbaro today; we are posting a closeup of his feet, since this is all our readers see of a horse anyway, and hopefully a second photo, showing his overall condition. Note: if you double-click on an image, it will open in a new window and you may be able to see a larger version, depending on resolution. Please note that the horse is wearing a Sigafoos glue-on shoe on his right hind (the leg that was broken) and a Soft Ride hoof boot on the left hind (foundered foot). Hilary Clayton PhD MRCVS, McPhail Dressage Chair in Equine Sports Medicine at Michigan State University College of Veterinary Medicine, proved once again this year that she was talk the talk and piaffe the piaffe, as she won two US Dressage Federation/Arabian Horse Association first place awards in Fourth Level and Prix St Georges levels. In both upper level standings, Hilary was riding her talented MSU MAGIC J+//, an Arabian gelding bred by the Michigan State horse breeding program and selected by Hilary for training in dressage based on his movement, rather than his conformation. 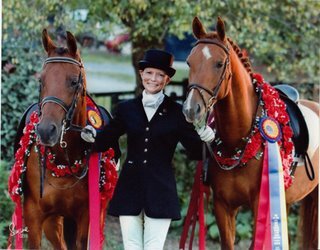 Lest you think that Magic is a one-horse wonder, Hilary also won the national championship at First Level with her young horse, MSU FANFARE+/, another campus homebred, who also placed third nationally at Training Level. Both horses have won national championships in the past few years. 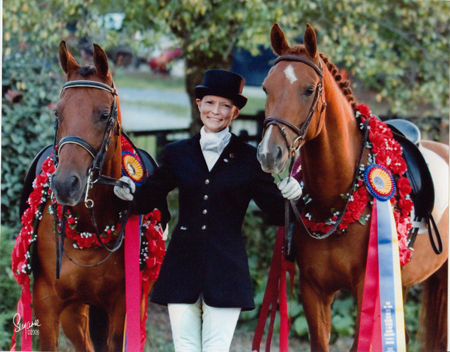 Dr. Clayton competes the horses both at breed shows and at open shows. She keeps the horses at home most of the year and cares for them herself. During the rough Michigan winters, the horses live on campus, where they can be ridden indoors. Five years ago, Dr. Clayton was seriously injured in a trailer mishap while loading her horses. She has made a remarkable recovery to be able to ride again, let alone ride at the upper levels. I had the pleasure of grooming for her at the Michigan Arabian Horse Show in May...and I'm glad I don't have to compete against her! By the way, Hilary has kept both these horses sound and competing at the very top of national levels without ever having shod either horse. Her farrier is Kappi Roghan, who applies what they term a "physiological trim" which Hilary has been analyzing in her laboratory with hoof anatomy expert Robert Bowker DVM. By the way, Hilary is one of several generous contributing editors to Hoofcare & Lameness Journal. She is also author of the books, Conditioning Sport Horses, and The Dynamic Horse, both available from http://www.hoofcare.com. Photos courtesy of Dr. Hilary Clayton. Mustad Hoofcare announced today that they have acquired the Farrier Product Division of Simonds International. Mustad is a one hundred seventy-four year old company that sells under the Mustad umbrella of branded hoofcare products, manufactured globally, and distributed worldwide. Simonds International, a company with a similar longevity also founded in 1832, has manufactured quality Rasps among other products at its plant in Newcomerstown, Ohio. Simonds Farrier Rasps will be seamlessly integrated into Mustad’s manufacturing and global distribution operations. Inquiries regarding this announcement should be directed to Mr. Carlos Xifra, Mustad Hoofcare Center, Inc. by calling, 1-866-668-7MHC (7642). Thanks to everyone who is organized enough, and especially thoughtful enough, to have their holiday cards in the mail--and include me on their lists. I love receiving them and thought I would post a few of my favorites. This is Oklahoma farrier and horseshoeing museum owner Lee Liles on his mule. The disguise didn't fool me for a minute. According to a report posted today on the Thoroughbred Times web site, Hoofcare & Lameness consulting editor Scott Morrison DVM of Rood and Riddle Equine Hospital in Lexington, Kentucky will be examining Barbaro's left hind foot, which was surgically debrided following his problems with support limb laminitis this summer. The report sets the appointment for Tuesday, December 19. 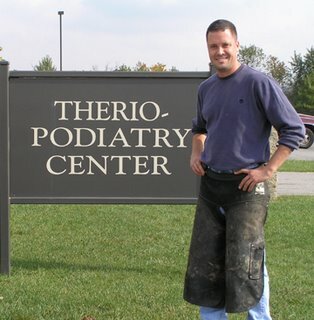 Dr. Morrison is the founder and head of the Podiatry Clinic at Rood and Riddle; his unit is the largest such clinic in the world. The clinic currently employs four foot-specialist veterinarians and four lameness-specialist farriers, as well as a staff of technicians and administrative support staff. Morrison is a specialist in laminitis and founder and consults on cases all over the world. Barbaro is still a patient at the University of Pennsylvania's New Bolton Center in Kennett Square but is expected to be moved to another facility this winter, according to interviews with owner Gretchen Jackson and with his attending veterinarian Kathy Anderson DVM of Fair Hill Training Center in Maryland. The horse has been at New Bolton Center since shattering his right hind leg during the running of the Preakness Stakes at nearby Pimlico Racetrack in Baltimore, Maryland in May 2006. The Honorary Fellowship is the highest honor awarded by the Worshipful Company of Farriers and such an award is only made to exceptional people who have made an exceptional longstanding contribution to the art, craft or science of farriery. It is even more exceptional for this award to be given to somebody from the other side of the world. Professor Chris Pollitt is one such exceptional person. With countless publications to his name, no one has done more to advance the scientific understanding of the intricacies of the horse's foot than Professor Pollitt. Chris is now entitled to use the letters (Hon)FWCF after his name. 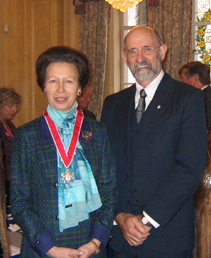 Photo: Dr. Pollitt with HRH Princess Anne, a former master of the Worshipful Company of Farriers and a devoted student of horse science. Long-time Kentucky farrier Paul Brewer died in a fall from a ladder on December 13, according to reports received here. The Lexington, Kentucky resident played a pivotal role in the growth of the American Farrier's Association in the 1980s and was for many years, the association's "IT" expert, as well as treasurer. 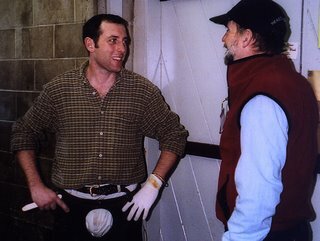 Paul wrote programs for the AFA's membership and competition scoring, and taught many farriers how useful a computer could be in their businesses. He planned and orchestrated the 1988 American Farrier's Association convention in Lexington, which is still remembered as one of the best-attended and most successful AFA conventions in history. I have known Paul as long as I have been in the farrier industry (and that is a long time). He was extremely dedicated to the AFA, and had a thriving business, known as The Bluegrass Forge, before retiring. His family's farm bordered the Kentucky Horse Park on Iron Works Pike in Lexington, and I have many fond memories of visiting his family and their horses. Paul was an invisible stalwart of every AFA convention for at least ten years. He was always behind the scenes, always worked long hours, and never asked for recognition. I was with him one fateful night when an error was discovered in the scoring of the competition, resulting in the naming of incorrect people to the American Farriers Team, and he vowed to create a computerized scoring program for the AFA, which he did. Paul was a champion of moving the association from its headquarters in New Mexico to the new office suite at the Kentucky Horse Park and fought diligently for the move, which was one of the most bitter political episodes in the AFA's history. He was also very involved in the Bluegrass Horseshoers Association. If you are a member of the AFA or if you enjoy the privileges of being a farrier in the 21st century, you have people like Paul Brewer to thank. "Another important piece of AFA history gone," sighed acting AFA executive director Mike Nolan today. Paul had been Mike's farrier for many years. The AFA's death notie for Paul is available at http://www.americanfarriers.org. A CT scan of the equine distal limb reveals the bony architecture. Image courtesy of Alex zur Linden, DVM, DACVR, Assistant Professor of Radiology at Ontario Veterinary College. 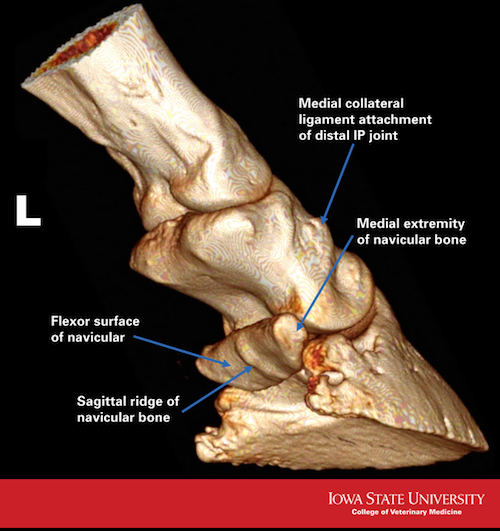 By now, most Hoof Blog readers know the mechanism behind degenerative bone loss that is so clearly illustrated by foot conditions like pedal osteitis and navicular degeneration. Tildren is the current great hope for treatment of those conditions, although only now it has only been studied in navicular disease and bone spavin. Still, there's hope! Enter a new hope this week, thanks to a study from the University of Pennsylvania, as mentioned in the journal Nature Medicine. Senior author Yongwon Choi, PhD, professor of Pathology and Laboratory Medicine at the University of Pennsylvania and colleagues report their findings. "The basic principles behind bone metabolism are largely understood, hence a handful of drugs treating osteoporosis are available. Most drugs inhibit osteoclasts, which cause bone decay. But there is also at least one that stimulates osteoblasts, enhancing bone formation. A combined treatment will not only prevent the occurrence of osteoporosis, but also make the quality of bone even better. "Our discovery proves that inhibiting osteoclasts while simultaneously stimulating new bone formation can be done. "Bone health is maintained by the balanced activities of osteoblasts and osteoclasts. The study shows that the inactivation of gene Atp6v0d2 in mice results in dramatically increased bone mass due to defective osteoclasts as well as enhanced bone formation. "These findings may provide some clarity into the regulation of bone metabolism and show that targeting the function of a single gene could possibly inhibit bone decay while stimulating bone formation." Before you start lining up all those lame horses, please realize that it may be a while before this gene therapy becomes a reality and trickles down to equine medicine. Then again, the equine model may be a good one for experimentation. Let's hope! It has been ten years since Hoofcare & Lameness subscriber Hilary Cloos graduated from Harvard University with a degree in physics. Just as many of her classmates went on to graduate studies in physics at places like New York's Cornell University, Hilary also headed to Cornell...but she chose to apply her physics to horses by studying with Michael Wildenstein to become a farrier. The Harvard Crimson, daily campus newspaper for the sprawling city-of-ivy down the road, published a tribute article to Hilary today. She is one of their unique graduates, that's for sure! Although...US Senator Lincoln Chafee of Rhode Island went to Montana State to study horseshoeing with Scott Simpson after he graduated from Brown University, also an ivy league school. Maybe there is a secret society of recovering ivy leaguers who are now servants of the hoof! 4) Dr. Castle McLaughlin, a cultural anthropologist and professor at Harvard's Peabody Museum, is founder of the Nokota Horse Conservancy, and compiled a 300-page study of the unique herd of wild horses in North Dakota, who are believed to be descended from the ponies of Sitting Bull. 5) Harvard University Press published a book I use a lot in research, Horse Power : A History of the Horse and Donkey in Human Societies by Juliet Clutton-Brock and most recently, the beautiful book Horses : History, Myth, Art by Catherine Johns. And something that matters to me: Harvard has been scanning some of its old and rare horseshoeing texts and adding them to the online archive of accessible references. Thank you! Senator Lincoln Chafee of Rhode Island will go back to being former-farrier Lincoln Chafee this week, as he packs up his office on Capitol Hill. Linc was defeated in his run for re-election in November, despite his moderate, bi-partisan votes on key issues that made him more of a Republicrat than a Republican. Still it wasn't enough for the voters in Rhode Island. He'll have more time for his horses now, and maybe he can help the horse industry a bit with his Washington connections. It was great to have you there, Linc. Time to forge ahead, Senator! CHEROKEE, AL and PLYMOUTH, MA (November 29, 2006)-- Life Data Labs and SmartPak Equine announced today that they have entered into a partnership to make Farrier's Formula available in SmartPaks. Farrier's Formula is the original hoof supplement, and has been shown effective in university studies as well as Life Data's own extensive research. "Farrier's Formula has been our most widely requested hoof product, and we are delighted to be able to offer it to our customers," said Paal Gisholt, SmartPak's President and CEO. "In getting to know the Life Data team, I have had the opportunity to see their commitment to making a quality product first hand, and their care and attention to product quality is exceptional." "We are happy to be making Farrier's Formula available to the many barns and individuals that have adopted the SmartPak feeding system," said Brian Jones, an executive with Life Data Labs. "We took advantage of the extra protection offered by the SmartPak delivery system to create a special concentrated version of Farrier's Formula that contains the same level of nutrients and benefits of the non-concentrated version," he continued. "Furthermore, our utilization of vacuum-packaging under nitrogen for delivery to SmartPak allows us to guarantee high levels of Omega 3 and Omega 6 fatty acids, along with Vitamin C, making this concentrate an excellent choice for skin and coat as well as hoof health," Jones concluded. Under the partnership, the companies agreed to a limited exclusivity. SmartPak has agreed not to offer hoof supplements that exactly copy Farrier's Formula and Life Data Labs has agreed that SmartPak will be the exclusive provider of Farrier's Formula in daily doses custom-packed for an individual horse. Other terms of the partnership were not disclosed. Note: SmartPak and Life Data Labs are two of the companies that generously support Hoofcare & Lameness Journal with advertising; Life Data also sponsored one of our "Hoofcare@Saratoga" evening lectures last year at Saratoga. SmartPak recently opened their first retail store here in the Boston area, and I have had the pleasure of shopping there. We are very pleased to see these two companies working together. Congratulations to both! We look forward to seeing them at the AAEP Convention next week. 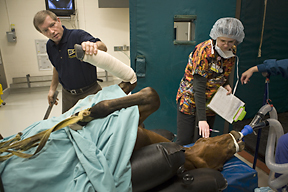 According to a report published today in The News Journal and its web site, Delaware Online, a quote attributed to Barbaro's veterinarian at Fair Hill, Kathy Anderson DVM, conjects that foot specialist Scott Morrison DVM of Rood and Riddle Equine Hospital in Lexington, KY will visit New Bolton Center within two weeks to consult on the condition of Barbaro's foundered foot and the possibility of shoeing it. Barbaro is still hospitalized at the George D. Widener Hospital at New Bolton Center of the University of Pennsylvania in Kennett Square, not far from Fair Hill. Stay tuned for more developments. Dr. Morrison will be a guest at the Hoofcare & Lameness booth at the American Association of Equine Practitioners Convention in San Antonio, Texas on Sunday, December 3rd and Monday, December 4th at 5:oo pm each day. We hope to see Dr. Anderson there too. Two of the world's most accomplished farriers are Allan and Jim Ferrie of Ayrshire, Scotland. Both are Fellows of the Worshipful Company of Farriers, top international competitors, and first-class educators. But first and foremost, they are Scotsmen, and as such they are impeccable ambassadors for the craft of farriery in their country. Plus they look great in those kilts. So impressed with these two men am I that within minutes of receiving a new DVD produced by them, I was searching for a DVD player. I usually am not anxious to watch tapes of shoemaking demonstrations or competitions, but I knew this would be different and I was correct. The DVD is a superb revelation on how and why the traditional Scottish heavy horse is shod the way it has been for so many years. The Ferries dissect the construction of the shoes into minute details (of both front and hind shoes) and relate the details of the shoe to the foot of the horse; you watch Allan forge each inch of the shoe, while Jim explains what Allan is doing, which is shown in slow motion. Sparks stop in mid-air. Admittedly, it looks all too easy, as if the steel in the shoe wanted to follow the focused nudge of the hammer's head. Every hammer blow has a distinct purpose; Allan's technique is a model of efficiency and artistry. The second half of the DVD is about the application of the shoe and the foot of the Clydesdale. The good news is that you too can stay up too late looking at feathery Clydesdale feet. The Ferrie Brothers' DVD will be sold by Hoofcare & Lameness, beginning December 1, 2006. Cost is at an introductory price of $49 plus $5 post to US addresses ($10 to the rest of the world). The price will be subject to change without notice because of the change in value of the dollar against the pound. To order, email dvd@hoofcare.com or call 978 281 3222. Mail checks to Hoofcare DVD, PO Box 6600, Gloucester MA 01930. Please note that the office will be closed from December 1 to December 6 while we are at the AAEP convention. Program chair for farriery Dr Steve O'Grady announced Monday that Bob Pethick has had to cancel his role in the AAEP's first farrier conference, to be held Tuesday, December 5 in San Antonio, for personal reasons. Michael Wildenstein FWCF (Hons), resident farrier and instructor at Cornell University College of Veterinary Medicine (and a contributing editor with Hoofcare & Lameness Journal, as is Bob Pethick) will take Bob's place and speak on the topic of hoof balance vs hoof mechanics. Sadly, we heard from another of our editors, Dr. Jean-Marie Denoix of France, that he will not be able to attend the convention. He will celebrate the Feast of St Eloi (patron saint of farriers and a national holiday in France) at home in Normandy on December 7. Dr. O'Grady also mentioned that the American Farrier's Association has appointed three farriers to the AAEP's liaison committee for terms beginning in 2007. They are John Suttle of California, Michael Wildenstein (see above), and Dan White, resident farrier at Iowa State University College of Veterinary Medicine. Easyboot Epic Named as Product of the Year! The Horse-Journal has named the Easyboot Epic one of the their Top 10 Products of the Year. "At the end of each year, we look back on the products that we've used in our test barns," say the editors of The Horse Journal. " We consider what various manufacturers have brought to the market and how those products make taking care of our horses easier. We select items that have improved our ability to optimize health care especially in ways that we can undertake ourselves. We look for products that keep safety in mind, work economically and/or simply solve problems. Above all, we look for products that make the biggest difference in our barns." "EasyCare took their well-known Easyboot and made it even better, adding a gaiter to the top. This addition makes the boot stay in place better than ever. Horses easily became accustomed to wearing the boot, and it stayed secure. Lightweight and flexible." 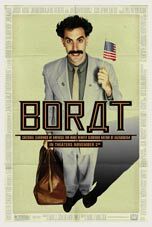 Roadblocks Can't Stop Kazakhstan's Horse Van: Borat Behind the Wheel? The Asian Equestrian Games are starting December 1 in Doha, Qatar...so where are the Kazak team's horses? This sounds like a Saturday Night Live skit takeoff on the film "Borat", as reported on the Internet. The cost to fly the horses was not in the budget, and there were issues about visas and quarantines, so they opted to drive...and it took 13 days (six days longer than expected) from their training camp in Germany. 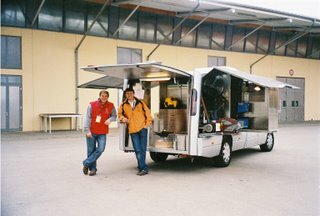 First they drove through Austria to Italy and then by ferry to Greece. Then overland to Turkey (where they had border problems) then on across that huge country to Syria (and more border problems), Jordan, and then across Saudi Arabia to Qatar, a distance of 6700 km. I would have loved to ride along and written a blog of their day-by-day adventures. But one must wonder: What was the condition of those horses when they stumbled off that truck into the blazing Qatar sun? Let's hope the van was air-conditioned. The Asian Games are fascinating, and I wish there was more media coverage here in the USA; we might all learn something about how the rest of the world lives (and rides). For instance, equestrian sports are one of the very few events in which women from strict Islamic nations are allowed to compete. Why? Because their bodies are covered, head to toe. Think about it. Iran's women's karate team is boycotting the Games because the rules won't allow them to wear their headscarves in competition. I'll be cheering for Kazakhstan. There's a good summary of this story on the English-language Chinese site. The Chinese are pumped up for the Asian Games in preparation for the 2008 Olympics, although the equestrian events will be held in hot, steamy Hong Kong instead of Beijing...and they may also be monitoring the equestrian transport issue as more and more countries in Asia are competing at the FEI level and must figure out how to get their horses to Hong Kong (and have them be healthy enough to compete). Hopefully the Kazaks won't have to drive there...just think if they received some small portion of the profits from that movie! Thanks to Dr. Steve O'Grady for checking in on Friday and providing some new information for farriers and veterinarians (and anyone else) attending the American Association of Equine Practitioners Convention in San Antonio December 3-6. 1. On-site registration will offer a one-day registration fee for $175 to anyone who wants to attend, for instance, Monday or Tuesday, and not the entire convention. This fee includes lunch and the trade show as well as all lectures and table topics. 1a. This just in from AAEP trade show manager Debbie Miles: "If someone wants to attend just the trade show, it is $25.00 a day. This will not allow them to work (in a) booth or attend any scientific sessions, just allows them to visit the trade show." 2. Farriers who register should identify themselves as farriers so a tally can be kept. Farriers are welcome (and encouraged) to attend any and all lectures offered at the convention in addition to the farrier-specific program on Tuesday morning. 3. Hoofcare & Lameness is publishing a "Survival Guide" to the convention specifically for those interested in the hoof programs. It will list all events, lectures, table topics, etc. with relevance to working with hooves. (Did you know there is a special program on endocrine problems, i.e. Cushings syndrome and the relation to obesity?) With a little luck, this will be posted on hoofcare.com for you to download by Thursday of this week. 4. Dr. Tracy Turner has replaced Dr. Andy Parks at one of the table topics discussions, according to Dr. O'Grady. 5. Hotel rooms are still available; the online rates for Homewood Suites and the Omni are both around $130 and both are near the convention center. All the "official" hotels (Marriott, Menger, etc.) are sold out as is the new LaQuinta. There are some very inexpensive hotels on the outskirts of San Antonio if you have a car. 6. Hoofcare & Lameness will have hourly special guests at our booth (#354), including Dr. Chris Pollitt, California farrier John Suttle, Bob Pethick, Michael Wildenstein, etc. We will provide bar stools and a table to lean on, plus maybe some napkins to draw on so you will feel right at home. We will also have free copies of the Animal Health Foundation's DVD, featuring Chris Pollitt and Katy Watts. We will also have a museum display (sorry, not for sale) of plastination anatomy models (a la the "Body Worlds" museum exhibit) from Dr Christophe Von Horst of Germany. 7. Southwest still has some cheap flights to San Antonio! 8. The trade show is huge (over 300 companies) and includes many companies (Delta, Mustad, HoofJack, HorseScience, Vettec, etc.) that you would normally see at a farrier convention. And some that you wouldn't see there, but whose products or services are interesting. The American Farrier's Association will have a booth, with president Dave Ferguson in charge, according to Mike Nolan, AFA executive director, and Jack Millman, the AFA's new marketing committee chairman. Please contact Hoofcare & Lameness if we can help you make plans! Patrick Reilly of Chester, New Hampshire will be changing his address on Monday, when he begins work as the new farrier at New Bolton Center, the site of the large animal clinics of the University of Pennsylvania's College of Veterinary Medicine. To quote a memo from the administration: "(we) announce the appointment of Mr. Patrick (Pat) Reilly as Interim Director of the Farrier Service at New Bolton Center....thanks to Rob Sigafoos for helping to recruit Pat to New Bolton Center as we know Pat's work will compliment the excellence in the Farrier Program that has been established by Rob." Rob's role at New Bolton is a little gray at the moment, since he is suffering from back problems but as far as I know, Rob has neither retired nor resigned, but is taking some time to recover. Both Rob and Patrick will serve on the faculty of the 4th International Equine Conference on Laminitis and Diseases of the Foot in Palm Beach (aka "Palm Beach Laminitis") in November 2007. Patrick has worked as consulting farrier at the New England Diagnostic Imaging Center (Myhre Equine Clinic) in Rochester, New Hampshire and also as a contract farrier for the Tufts Cummings School of Veterinary Medicine in North Grafton, Massachusetts. Until the hospital closed, he was consulting farrier at the Rochester Equine Clinic in New Hampshire. Patrick is known for his expertise (and preference) for adhesive shoeing. I heard him say once at a conference that he had applied more than 300 pairs of glue-on shoes,primarily of the Sigafoos design, that year. He is also an early-adapter of technology, and was the farrier who taught me about Metron software. He has loaned me his laptop when mine was smoking from system overload. Patrick also has a fascination with biomechanics research; he actually reads all those charts and graphs, and has experimented with the interesting Tekscan pressure measuring system. No word yet on whether Patrick will be working on New Bolton's most famous patient, Barbaro. Please scroll down to posts from earlier in November or click here to read our "hail and farewell and hello again" to departing resident farrier at New Bolton, Laura Florence. Good luck to Patrick! Get well to Rob! Photo: Patrick Reilly (left) chats with Rob Sigafoos (right) at a recent conference. Fran Jurga photo, © Hoofcare & Lameness Journal. All HoofBlog text and images © Hoofcare Publishing 2006 unless otherwise noted. The BBC has posted an RSPCA story from the UK which stimulated some discussion today. 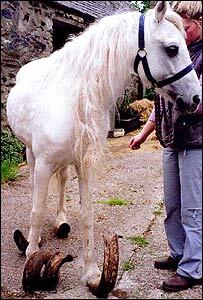 A pony stallion was found in Wales with neglected hooves, one of which was over a meter long. I wondered simultaneously at the cruelty of the owner to ignore the poor horse, but also wondered if there is a Guiness Book of World Records for the longest pony hooves? Amazingly, it doesn't sound as if the horse had laminitis. He grew quite a mane too, but doesn't look hungry. If you take a good look at the photo, it is obviously the right front that grew to the great length that it did a spiral; the left front is growing in with much wider radius...and straight up in the air. After listening to or reading Meike Van Heel's research on asymmetric stance and foal development, this difference jumps right out at you. Conformation Conundrum at the Brookfield Zoo: But Can She Trot? What do you get if you cross a giraffe and a zebra? And what if you throw in a little moose and, um, maybe some Oldenburg warmblood genes? 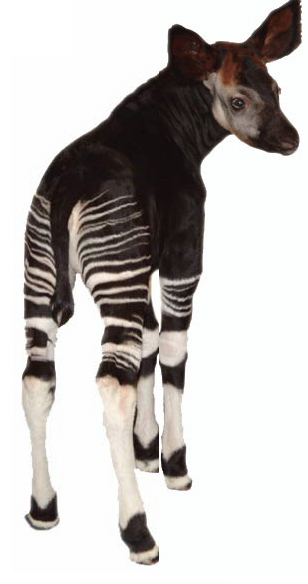 Chances are, it would look a lot like Sauda, the new Okapi calf born this fall at the Brookfield Zoo in Wisconsin. A shy native of the dark forests of the Democratic Republic of Congo, the okapi makes you want to sit back for a minute this Thanksgiving day, and thank Nature for not providing too-easy answers to all the questions we have about life on earth. Several people have asked if a particular type of shoe was used on the horses at the Breeders Cup. (see story further down on this blog) The answer is that there were as many shoes as there were horses..or as many different farriers working on them. From what we hear, Round Pond (winner of the Breeders Cup Distaff, trained by Michael Matz) was wearing race plates with Sigafoos cuffs. Most farriers start with a standard raceplate and add sometimes tabs over the bars, a la “onions”. Another technique is to add wings, or large clips of perforated aluminum, to increase the glue’s surface area. The Sigafoos cuff is another option. In this photo, you see a large aluminum clip or “wing” welded to a raceplate. This photo was supplied by Raul Bras DVM of Rood and Riddle Equine Hospital in Lexington, Kentucky. Luwex 2006: The World’s Most Intense Farrier Event? 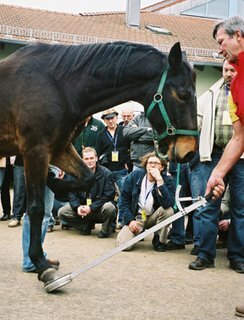 I used to think that farrier competitions were tense, but then I went to Germany and experienced the Luwex Hufsymposium. No competitions at this event (except for a shoeing rig contest that was terrific) but the pressure was on. Lectures start at 7 a.m. and the last one begins at 10 p.m. I left Mike Savoldi from California still lecturing, however informally, to a dedicated group at midnight in one of the lecture halls. 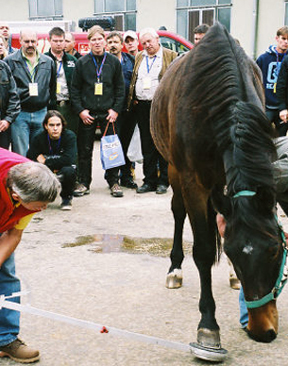 The marathon shoeing sessions are the focus of the day, as the speakers are put to the test in front of more than 500 farriers from 21 nations. As the cases roll in (and keep rolling in) the speakers evaluate the hooves, shoe them in front of an audience with a camera crew with microphones dangling in their faces, and eager veterinarian translators hanging on their every word. Oh, and an American editor popping off a flash every few seconds. Three shoeing stations are going constantly, with a trade show in the same arena…and a pub, too. 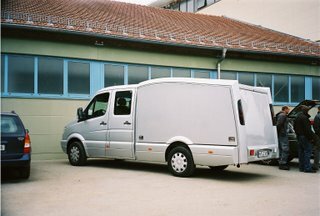 The visiting speakers shoe the horses often without their own tools, in the case of the Americans, and with the use of borrowed, albeit high tech farrier rigs crafted from Mercedes vans. If James Bond needed a farrier rig, he'd probably model his fter Rob Renirie's or Bernard Duvernay's or maybe the super-tall Mercedes of Dieter Krohnert. It would be criminal to leave a scratch, or to have a horse rap one of these rigs with an impatient hoof. 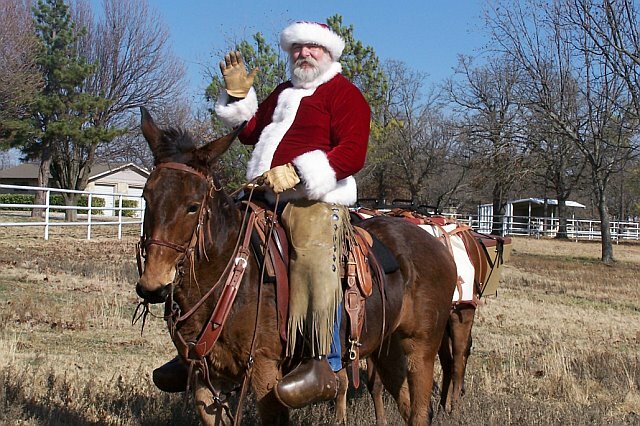 The newly-shod horse is trotted out for all to see…and he’d better be more sound than he was a few hours before. That’s sometimes a tall order for a horse that has been sedated or even just standing around for the hours it can take to get through a demonstration. Sigi, the Icelandic farrier who did a great demo, took "clinician macho" to a new level when he hopped on his demo horse and headed for the tolting track on the grounds to demonstrate (at high speed) what the horse could do now that his feet were straightened out. 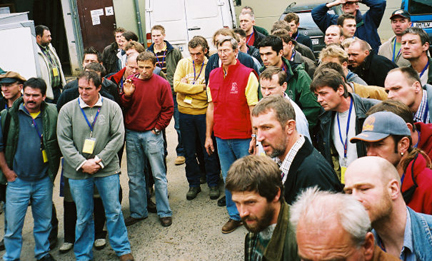 In this photo you see Switzerland’s Bernard Duvernay (red vest, center) anxiously watching his demo horse trot after shoeing. Look at the faces of the farriers in the crowd. If you make a mistake, these guys will remember it. Bernie did just fine. Bernard divides his time between running a high-tech multi-farrier practice in posh Geneva (where he cruises the lake on a beautifully restored 1920s tug boat) and serving as a farrier education consultant in Third World countries. He might pop up almost anywhere there are horses, but is most often in India. In Germany, he had a young Iranian apprentice visiting him, Ahmad Abad, who turned out to be half-American and a frequent guest here, so you may meet him at an event. One of the most interesting products demonstrated at the Luwex Hufsympsium in Germany in October was what I called the “hoof lifter”, developed by Italian vet/farrier Hans Castilijns DVM, made in Italy, and demo’d by Swiss farrier Bernard Duvernay. The horse stands on the device, which is covered with a rubber mat. It looks like that puck-like thing that curlers push around on the ice, with a three-foot handle and a protractor on the end. The operator stands one foot on the device and then stands back and slow raises the angle so that the horse is putting more and more pressure on the back of the foot as the coffin joint flexes. After observing the horse, the operator than simply swivels the handle, without having to move the horse, and then can raise the lateral side of the device, tipping the foot to the medial side. 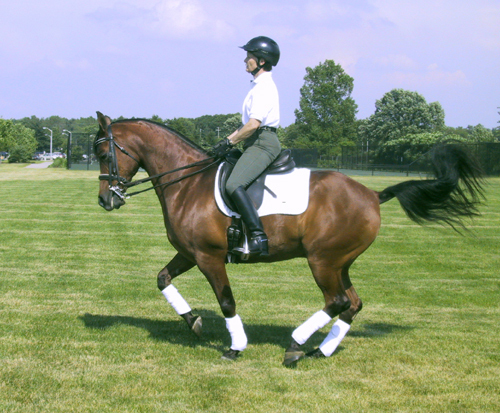 Accordingly, without moving the foot, the operator moves to the other side of the horse to test the lateral side. The Europeans have always been keen on the hoof-lifting coffin-joint flexion tests for navicular pain, and this device gives expanded pain-response capabilities. It is well made and simple to use, but seems to keep the handler safe, too. In October, I was on hand at the Luwex Hufsymposium in Krueth, Germany to see the first horse shod in public with Equilibrium shoes, the new shoe design from Mustad that was developed using research techniques pioneered by Meike Van Heel during PhD studies at the University of Utrecht in Holland. But first, the horse! One of the interesting things about the Luwex event is that they brought back the horses that the speakers had shod the previous year, and they discussed how the horses were doing. He was a mature Hanoverian stallion training at the Grand Prix level. They spoke in German, of course, but I think I understood. This horse had been shod with spider shoes by Dieter Krohnert, farrier to the German international teams, in 2005. He developed the shoe, which is similar to our aluminum spider plates that are riveted to shoes as an interface device. Dieter said he thought the shoes had been successful the year before but that the horse had not been well cared for and perhaps had gone long periods without trimming. The heel bulbs contracted and thrush or some other bacterial infection had gone up the back of the pastern. The horse had medial quarter cracks in both front feet. Dieter re-shod the horse with the new Mustad Equilibrium shoes, which are designed for easy breakover across the entire toe surface of the shoe. The horse strode out very freely after standing for three hours to be shod in the demonstration. Dieter asked his helper to really trot the horse out and show what he could do, which he did, and then took a flying, bucking leap into the crowd. 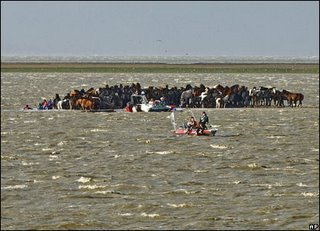 About 50 farriers ducked and ran, missing the flying hooves by inches. I think I saw Dieter's hair turn gray right before my eyes but, as always, he kept his cool, shrugged, and said with classic understatement, "See, he's sound now." For more about Dieter Krohnert, read "High-End Hoofcare for High-Flying Horses : Dieter Kronhert and Steve Teichman" by Fran Jurga in Hoofcare + Lameness: Journal of Equine Foot Science, Issue 76. (print only) Also search the blog for articles about Dieter. All HoofBlog text and images ©Hoofcare Publishing 2006 unless otherwise noted. At the education-oriented Luwex Hufsymposium in Krueth, Germany in October, the only competition was for the title of “best rig”. What a collection! One of my favorites was a full cab old-timey Land Rover. Perfect for the farrier who does safari horses. And a homey Mercedes station wagon with a forge in the back. And there were trailers and vans and trucks, oh my. And then there was The Truck. Loic Entwistle’s new Mercedes custom truck is worth a second look, and a third. It even has a “store” full of horsecare supplies and supplements for customers to buy. It is hidden from view until he pushes a button and it glides out with all the products on display. Loic is a German farrier and an old friend of Hoofcare & Lameness. He has been a subscriber since 1994. And I think he has been dreaming about this truck even longer! Also in the photo: Italian veterinarian Lorenzo d`Arpe, who will be a speaker at the Bluegrass Laminitis Symposium in Louisville, KY in January 2007. This might explain, to bemused foreigners, why today’s newspapers are so brimming with news of the death of the great steeplechaser Desert Orchid. Every decade or so, in a process almost as mystical as the emergence of a new pope, the name of a thoroughbred escapes the cloistered world of racetrack bookies, and of punters hunched in betting shops tearing up betting slips scrawled with the names of nags so slow that they were beaten to the finishing line by the groundsman cutting the turf for the next meeting, to become as familiar to the general public as Lester Piggott’s tax returns. Desert Orchid belonged to this elite stable, which stretches from Arkle — reckoned to be the greatest steeplechaser of all time — through Nijinsky, the last horse to win the English Triple Crown, Red Rum, the only one to win the Grand National three times, Shergar, the kidnapped winner of the 1981 Derby, and the explosively fast Dancing Brave, to Best Mate, the first steeplechaser since Arkle to bag three successive Cheltenham Gold Cup wins. These are names as well known to most Britons as Silver, the Lone Ranger’s mount, Roy Rogers’ Trigger or Boxer, from Orwell’s Animal Farm. Barbaro’s left hind foot, which had laminitis, was also fully evaluated while he was under anesthesia. “There are no signs of new problems with that foot, but the hoof needs several more months of growth before we will know how much foot structure and function will be recovered," said Dr. Richardson. Resident farrier and researcher Laura Florence has resigned her post at the University of Pennsylvania’s New Bolton Center after almost five years of service there. Laura reports that she will now pursue a private consulting practice under the name of Holistic Hoofcare, and that she plans to stay in the Philadelphia area. “(My) impetus is to concentrate more on therapeutic benefits of trimming/barefoot. Though I won't be ruling out shoeing...it will not be a focus,” Florence predicted by email. An interesting part of Laura’s work has been research on the hoof growth and adaptation of a herd of left-alone ponies at New Bolton Center with behaviorist Dr. Sue McDonnell. Florence’s research will be published soon in Equine Veterinary Journal; watch for the title “Hoof growth and wear of semi-feral ponies during an annual summer 'self-trimming' period”. 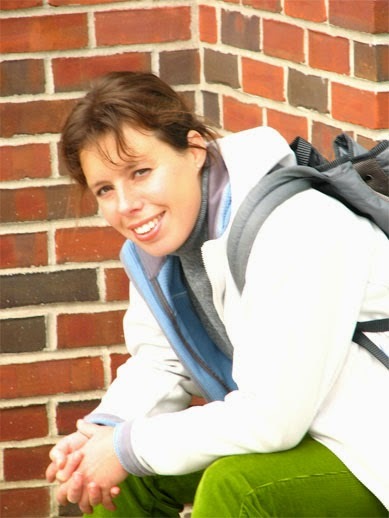 Laura's official title was Special Research Fellow of the Dorothy Russell Havemeyer Foundation for 2004–2006. To quote from the UPenn web site: "This appointment supports ongoing research of the hoof growth and natural trim cycle of the semi-feral equid. The goal of the study is to systematically describe equine hoof growth and wear characteristics under natural environmental and social conditions, using the semi-feral herd at New Bolton Center as one model." Laura also played a key role in the 2nd International Equine Conference on Laminitis and Diseases of the Foot in Palm Beach. We hope that Laura Florence will continue to provide positive input to Hoofcare & Lameness Journal. Photo: Therapist Diane Volz of Louisville, a subscriber to Hoofcare & Lameness Journal, helped at least 30 of the Breeders Cup entrees with bruised feet, sore backs, aching legs, and anxiety problems during the week leading up to the races. Photo by Fran Jurga, copyright Hoofcare Publishing. First, let's talk about Round Pond and her heartwarming win of the Distaff being marred by the tragedy of the death of Pine Island and the breakdown of Fleet Indian. I am sure that those crashes are being replayed on the evening news tonight around the world. Just last May, Round Pond's trainer Michael Matz was watching from the stands at Pimlico when his star horse, Barbaro, stumbled to a halt on the track in front of him, his fetlock dangling. But today, Matz was back in the winner's circle where he had stood with Barbaro after the colt's dramatic win of the Kentucky Derby in May. And he was looking over his shoulder at the horse ambulance. Did someone call the screenwriters' guild? But Round Pond has a hoof story. According to the web site allaroundphilly.com, Round Pound sat out nearly five months this year because of hoof problems. Originally thought to be a foot bruise, the injury didn't clear up, so the filly was shipped to the podiatry unit at Rood & Riddle Equine Hospital in Lexington, Kentucky, where she was treated by Hoofcare & Lameness Journal consulting editor Scott Morrison DVM and his staff. "They figured out that Round Pond has very thinly soled feet, and the nails from a standard shoe tend to pinch her feet," explained Round Pond's owner, Delaware car dealer Rick Porter, in the Philadelphia newspaper article. "The answer was to use glue-on shoes, which she used in the Beldame and will wear for the Breeders' Cup." Round Pond, by the way, is a real place; it is one of my favorite little Muscongus Bay towns on the coast of Maine. The filly Malibu Mint recently set a Polytrack record at Keeneland in Lexington, KY wearing the shoes; she didn't do quite so well against the colts in the Breeders Cup Sprint today. Gary Mandella's Silent Name in the Mile also wore the shoes, as did Brother Derek, trained by Dan Hendricks, who led for about half of the $5 Million Breeders Cup Classic (powered by Dodge) before fading. Curtis and Diane Burns currently make the wire-cored urethane shoes themselves; scroll down for a more detailed article about the shoes, deeper in this blog; you can also click on the August archive link button in the right hand column. Brother Derek, by the way, is usually shoeless; Hendricks prefers to train the colt barefoot. 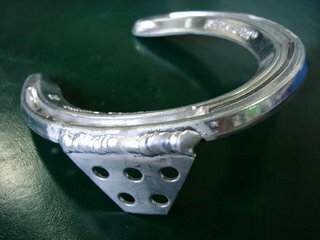 He had farrier/inventor Curtis Burns glue the see-through shoes onto the colt before the Goodwood at Santa Anita, where the horse ran second to Lava Man. The horse continued to train in the shoes, shipped east, and ran in them today. I haven't checked in with my friends Dan Burke from Farrier Product Distribution and Steve Norman, ace shoer at Churchill to see what sorts of special shoes they whipped up, or saw whipped up, but I will update this story when I hear from Dan. He's in Virginia at Danny Ward's big farrier clinic today--along with everyone else in the farrier world! Not to be outdone by the farriers, Hoofcare & Lameness subscribers Mimi Porter and Diane Volz have been hard at work all week providing therapy to the horses at Churchill. According to a news story on businesswire.com, Diane has used the Equitonic massager on 30 horses bound for the Cup races today. Since she provides therapy for the Todd Pletcher stable, that would be 17 horses right there. I know Diane will be heartbroken by the injury to Pletcher's Fleet Indian, but it sounds like the filly will recover. AAEP On Call veterinarians Wayne McIlwraith and Larry Bramlage had a busy day. ESPN seemed to keep a bit more distance from the tragedy than the network sports broadcast team at the Preakness. Finally, the day ended with South American superstar Invasor running down the favorite Bernardini. I don't know what that horse had on his feet, but they worked just fine. I know a little bit about Invasor. Every time I saw him at Saratoga this summer he was sulking in his stall, but his existence here is thanks to Hoofcare & Lameness friend Hassan bin Ali, endurance racing trainer for Sheik Hamdan al Maktoum, and a former bloodstock agent for Sheik Hamdan's Shadwell Stud. Hassan, who is an avid follower of shoeing technology innovations, popped in here one day last August in the middle of a heat wave, which was like a cold day in Dubai. He showed me videos on his cell phone and camera; he came here straight from Uruguay, where he had been buying endurance horses. To show off the sale horses, they galloped them on a paved road for miles, with Hassan following in a car with the windshield wipers flapping back and forth. It was quite a video. I made a comment about road founder and he laughed. "Oh, and I bought a racehorse, too, while I was down there," he added nonchalantly. "The champion of Uruguay. I think maybe he will win the Breeders Cup." The next time I saw Hassan was in the winner's circle after the Whitney at Saratoga. And today his impulse buy for the Sheikh won not just a Breeders Cup race, but THE Breeders Cup race, the Classic. One of the saddest things about the end of the Breeders Cup, after the death of Pine Island, is that so many of the horses will not ship back to Belmont and Santa Anita, or even to Florida. They'll just take a 90-minute van ride to Lexington and their racing shoes will be pulled off forever as they start new careers in the breeding shed and broodmare band. It was great to see older horse Better Talk Now charge up to second place in the Turf; sadly, 7-year-old Perfect Drift didn't do much in the Classic. I'd like give a big thanks to all of the horses, and to the people who have worked so hard all year to keep them sound. This year had many fewer horses lost in the final weeks because of foot lameness. Is it the glue? Is it training on the Polytrack at Keeneland? Was it the wet summer up here in the North? I don't know, but racing has been great fun to follow this year, and the fact that they all have four feet means that the odds of me finding a story to tell are probably better than that I will ever cash a winning ticket. Readers: if you have hoof-related stories from today's Breeders Cup, please send an email to fran@hoofcare.com and I'll share it! This and all content on the Hoof Blog copyright 2006 Hoofcare Publishing. No use without permission. The Hoof Blog is created by Fran Jurga as an adjunct to Hoofcare & Lameness: Journal of Equine Foot Science. . For more information or to subscribe, please visit www.hoofcare.com or call 978 281 3222 in the USA. Northern Maine Community College in Presque Isle, Maine is the latest college to launch a new farrier program. The first class will be offered in the summer of 2007, with farrier Bob Solman of Caribou as instructor. The new school will adhere to the Natural Balance theory of trimming and shoeing and will the third farrier school in the United States (that I can validate) to offer an exclusively Natural Balance approach to farrier education. 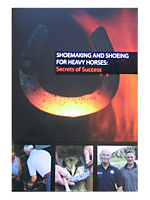 In an interview with Hoofcare & Lameness on November 3rd, Solman said that the course will have three modules: two weeks of trimming, four weeks of shoeing, and four weeks of advanced shoeing. Bob was one of the first group of farriers to pass the new Natural Balance certification testing process this summer. While Bob says that the program has been approved, the college's web site says it is looking for horses for the students to shoe. Keep an eye on http://www.nmcc.edu/farrier.php for more details. 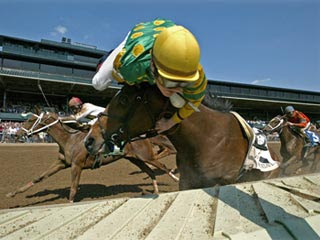 The fashionable use of the egg-bar shoe on performance may have peaked, but arguments over how and if the shoe helps performance horses or hurts them will go on and on and on. 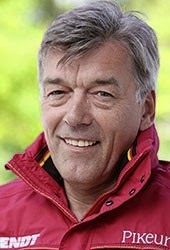 Professor Jean-Marie Denoix of France has long been a stickler about the use of egg bars depending on if the horse is laid up or competing and, if competing or turned out, what surface the horse is working on. We now have a new report from the vet school at Alfort in Paris, conducted by Denoix, with Henry Chateau and Christine Degueurce. 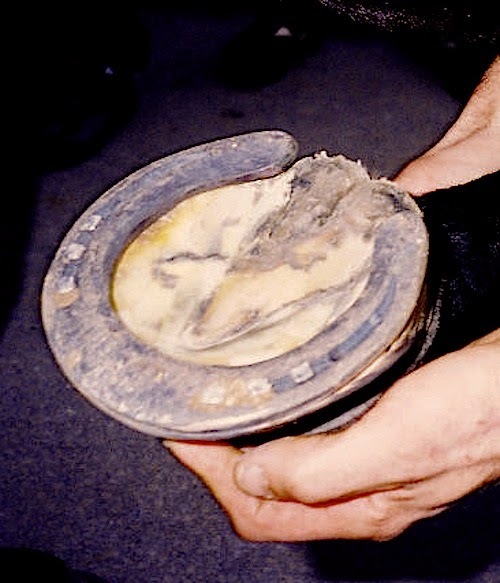 They took the egg bar out of the hard force-plate track, which is how the shoe was tested by Alan Wilson's Motion and Locomotion Laboratory at the Royal Veterinary College in England. The French group tested it in sand. Alas, the report does not specify if steel or aluminum was used, and what the thickness and width of the bar was. We will try to obtain that information. It is also not known if they measured both front and hind effects of egg bars. The data published is only on the front feet. They used four sound horses and found that, compared to normal shoes, the heels really did sink less into the sand with the egg bars and that the horses' heels were raised at mid-stance phase, compared to plain shoes. Maximal flexion of the coffin and pastern joints was increased and extension of the coffin joint at heel-off (aka "breakover") was reduced. In three-dimensional analysis, the egg bar affected the medial quarter's sinking into the ground. Based on these findings, Denoix's group felt justified in recommending egg bar shoes for horses working in soft footing who might benefit from these changes in joint angles or who would work better moving more "over" than "into" soft footing. "The foot topics will kick off on Sunday afternoon December 3, 2006 with 3 X one and one half hour table topics. These are sessions on a given topic with two facilitators where a discussion is generated among the attendes. "I will facilitate one on barefoot versus shod with Dr Dan Marks. This is a very controversial subject which will no doubt stimulate debate especially with farriers present. "Two well veterinarians, Kent Carter and Tracy Turner will direct a session on foot lameness which always turns out to be a learning experience. "Finally, Bill Moyer and well known farrier Rob Sigafoos will man a session on the management of various hoof wall defects. These two practitioners have a world of experience on crack repair. "I will post highlights of the upcoming convention periodically in the near future. It should be a great experience for all." Here's a link to some great stills and a video clip of the rescue of 100 horses stranded in floodwaters in Holland. I was stranded there myself, albeit in the comfort of the airport, earlier this week. Link to a Great Article! Everyone in the realm of Hoofcare & Lameness knows Michael Wildenstein, farrier at Cornell University's College of Veterinary Medicine. Mike is a consulting editor here at the magazine and a great friend. He'll be hosting Cornell's highly-regarded farrier conference next weekend at the large animal hospital, which will attract farriers from all over the country. Photo by Jason Koski/University Photo. This just in: A new research report from the University of Vienna details a thoughtful project that many on the practical side of hoof research have wondered about for a long time. At the recent International Conference on Equine Exercise Physiology (ICEEP) held in Fontainebleu, France in August 2006, researchers Girtler, Licka, Kicker, and Peham walked around to the back end of the horse to compare their colleagues' research findings from the front end. They evaluated the horses barefoot, then added a 2 cm and finally a 4 cm wedge to the hind feet and worked the horses at a walk and a trot on a treadmill, with 8 markers per limb and 15 cycles per effort, per horse. Among their findings: the angle of the coffin joint changed significantly between the walk and the trot; raising the heels increased the angle more at the walk than at the trot. Fetlock extension in the mid-stance phase was reduced when the wedges were added. They concluded: "Raised heels decrease hind fetlock extension, which is different to the effect of raised heels on the fore fetlock. Additionally, raised heels led to a significant reduction of hock extension during stance phase at walk and trot, supporting the reported positive influence of raised heels in horses with spavin." Hoofcare & Lameness just learned that friendly salesman Cal Chilton has left the employment of Vettec. I have hardly ever been to a farrier event on the east coastt without seeing his friendly face and Cal has been a wonderful friend and help to many exhibitors and event organizers--as well as to farriers interested in Vettec's excellent products. It just won't be the same without you, Cal. Good luck and stay in touch! UPDATE: As most of you know, the AAEP is hosting its first-ever farriers conference at their 2006 convention in San Antonio, Texas, to be held December 3-6. The farrier program is on Tuesday, December 5, but farriers can also attend any programs they wish, including a special program on palmar foot pain, during the convention. I spoke with Dr. Steve O'Grady (AAEP's farrier conference organizer) over the weekend because I knew the deadline for the lower advanced registration price was coming up (today). The form can be a little confusing if you are trying to register as a non-vet. There is no place on the form that specifically says "farrier"; instead, you should just register as a "Spouse/Guest attending sessions" and, in the box, write "farrier". Don't worry if you have already registered and didn't write in the box. By the way, Dr. O'Grady said that the AAEP has agreed to extend the registration deadline for farriers to receive the discount rate of $395 for at least one more week (til 10/30/06). I wrote a little article about the conference for the November issue of EQUUS, which people are receiving right about now, so it is a wonderful idea to extend the deadline for all the readers of that magazine who might want to attend. I have already spoken to or heard from a lot of farriers, from all over the country, who plan to attend this first-ever farrier conference at an AAEP convention. The farriers-only conference doesn't seem to be listed on the AAEP site, but you will find info on the general lameness and foot lectures listed there, all of which are open to farriers. It is easy to register online but I am sure that you could probably also print out the form and mail or fax it to the AAEP. Anyone who is attending and would like to be part of my informal network to stay in touch with developments and get tips on how to make the most of the convention's offerings and whatever impromptu fun that I can organize for the hoof-inclined, send me an email (fran@hoofcare.com) and I'll share with you anything I know. Hoofcare & Lameness Journal will launch a special San Antonio-bound blog as soon as I get back next week.